The Gay Gamer: A little translation assistance, please? So, I've been playing the Game Gear port of Namco's Mappy on and off over the last week or so. Why have I been playing this version as opposed to the arcade original, which I bought a few years back via the Wii Virtual Console, or the Famicom port (see a photo of it here) that I picked up in late 2009? I'm not sure, to tell you the truth. I guess I'm just in a Game Gear kind of mood right now. Anyway, I bring all of this up here because this iteration's options screen, below, has me feeling completely stumped at the moment and I'm hoping one or more of you will be able to translate--into English, naturally--the second and third choices for me. By the way, those of you who consider yourselves to be Mappy fans but have never played the Game Gear port might like to know that choosing the second option takes you to a set of levels that are much more expansive than those found in the arcade original. I'd almost liken them to playing in an apartment setting as opposed to a house setting, if that makes sense. As for what happens when you choose the third option: Strangely, the answer seems to be nothing, at least at the moment. (Whenever I click on it, the carrot cursor simply moves back up to "MAPPY.") Maybe it's a series of more challenging levels that open up only after you've conquered the originals? third option "対戦MAPPY", let's go ahead and call it "VS Battle"
that second one uh, dang. gimmie a few. i think we're getting into poetic license with the language here and i go about as far as "take magic sword, kill fire dragon." my best guess would be that -sama honorific is instead a noun ending indicating likeness, seeming, in the style of, etc; maybe it's supposed to be "an older-style," as in the sort of apartment your grandparents might have lived in. It's write something about a challenge, the second row say "the challenge of (something...)" and the third, Mappy's Challenge. Hey there, Sharc! Oh, thank you so much for helping with this :) There's *very* little on the Internet about this particular version of Mappy (in English, at least), so I'd had zero luck finding any info on my own. As for your description of the second option, sharc: That makes sense, too. Given what you said about ancestors and such, I wonder if what's really going on in this option is that you're playing in some sort of castle or ruin? It doesn't really *look* like an apartment, you see, although the size/scale are about right. Rather, it's very dark/bleak and made up of gray bricks and little else. Anyway, given all you've said about it, thinking of the setting as being a castle or something like that makes quite a bit of sense, don't you think? Thank you for chiming in, too, Pix3l! The third option being "Mappy's Challenge" definitely makes sense. And I have a feeling sharc is right about the third option being something along the lines of "the challenge of the ancestors," or something like that. I know a little of Japanese, and I can tell you that this symbol の (no) means "of" and this couple 挑戦 (chousenjou) means challenge. Hope you don't mind me asking, Pix3l, but where/when/how did you learn Japanese? Anyway, take a better look at the text, I think the third line mean "challenge mappy" since there's no の symbol in it, I think it's VS CPU game. Thanks for the response, Pix3l :) And thanks, too, for the link to "Japanese Training." I'll have to check that out! I've been meaning to start learning Japanese for ages, but I've yet to do so for many (rather stupid, admittedly) reasons. As for your thoughts on the third option: Yes, I think you're right. Sadly, I'll probably never be able to test it out, even after I get a copy of Mappy and a Game Gear system (which I will -- and soon! ), as it surely requires two GGs and two copies of Mappy. Oh, well! I agree with everything that was said here. I'll only add some information. 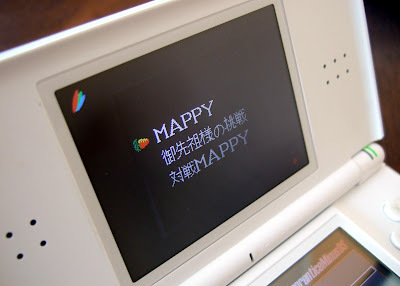 The third option is "Taisen MAPPY" (対戦ＭＡＰＰＹ), and as stated before, it means "VS MAPPY". The second option is called "Gosenzo-sama no chōsen" (御先祖様の挑戦). "Gosenzo-sama" ("Ancestor", as was said here) is a green coin that appears when you take too long to complete the level (image). Why the game mode have that name and why the coin have that name? I don't know. A level is completed when all the loot is retrieved. If Mappy tarries too long, a "Hurry" sign appears after which the music and the cats speed up, and more Mewkies are added (two will appear ready to drop as the Mewkies normally do immediately following the hurry message, and more Mewkies can arrive later on). If the player waits too long after this, the "Gosenzo" coin (a blue disk shape with Nyamco's face on it) will drop onto the top-middle platform and chase Mappy in a manner similar to the Mewkies, but more effectively. The "Gosenzo" coin can harm Mappy even if he is in the air. A little explanation: Gosenzo-sama is blue in the Arcade version, and green in Game Gear. The only thing I saw about this "Challenge of the Ancestor" is that there are 16 levels that loop. It's funny that I've yet to run into this Gosenzo coin yet. Maybe I just clear stages too quickly (or, more likely, 'die' too early)? BTW, thank you for sharing the screenshot. I can see now that the second option ('Gosenzo-sama no chōsen') is, indeed, set in a castle, or something similar. And there are 16 levels that loop in that particular game mode? Sounds great to me! Well, I wouldn't write about this, but I changed my mind. I saw in this blog that there are some cheats for the game, including a new game mode. I'll translate them for you (and for anyone) here, if you want to use them someday. During the title screen, press 2, 2, 1, 1, 1, 2, 2, 1, and START. During the title screen, press 2, 1, 2, 1, 1, 1, 2, 1, and START. During the title screen, press 2, 1, 2, 2, 2, 1, 2, 1, and START. Thanks, Anne! Yeah, I'm playing GG games via emulation at the moment. I actually own a few GG games (and I'm planning to buy more shortly), but since I don't yet have an actual GG system to play them on, well, emulation is the only way -- and playing them via emu on my DS Lite is the only way to go in such a situation, don't you think? I'm especially intrigued by the balloon mode/game. Guess I'll have to try it in just a bit! Thanks anyway, Adam! I'm guessing you're more knowledgeable about katakana than kanji, eh? The game looks cool! I'll check it out sometime. I don't want to spoil anything about the "balloon game", but there is a picture of it in that blog that I mentioned. I recommend that you check first on your DS!